Your US Boatworks remanufactured unit is assembled to provide like-new performance and longevity under normal operation and care. If you should have a problem, your unit may be covered under our limited warranty. After reading and meeting the warranty conditions below, please contact us to begin the warranty procedure. Warranty: One year from date of original purchase – parts & labor only. This warranty extends only to the original purchaser and begins upon receipt of the product and is non transferable. Dis-assembly of any product manufactured by US Boatworks without prior approval will void your warranty. Every US Boatworks remanufactured product is coded by us to protect the user and the re-manufacturer. The buyer acknowledges for this warranty to be in effect and to receive proper life and performance from the remanufactured unit, additional components must be inspected, repaired or replaced when the unit is installed. Extensive corrosion damage to stern drive. Dry start, abuse, abnormal operation or modifications. 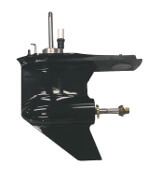 Damaged or inefficient accessory parts including partial stern drive units. The remanufactured unit must be properly installed following proper procedure to prevent accident or injury. In the event that a warranty claim is required outside the continental United States, with the exception of Alaska and Hawaii, there may be additional charges not covered under this warranty. These additional charges are the responsibility of the purchaser. Due to design limitations, all units installed on applications exceeding horsepower limits set forth by the original equipment manufacturer will not be warranted. The warranty does not include consequential or incidental damage, loss of use, profits, income, fees, dock storage fees, telephone calls, freight, lodging, alternative transportation, etc, repair by anyone other than U.S. Boatworks. This limited warranty of seller shall terminate after one year from date of invoice. Buyer is responsible for all defects thereafter, irrespective of causes. Any repair or replacement by seller will not extend above warranty. The buyer must notify seller of any warranty claim prior to repair, for authorization of claim by U.S. Boatworks. The limited warranty of seller set forth above to repair or replace defects on workmanship or material attributable to seller within the above time limit is in lieu of any and all other warranties, express or implied. Seller makes no warranty of merchantability or fitness for a particular purpose. It is an express condition precedent to the limited warranty of seller set forth above that buyer must notify seller in writing of any warranty claim. Warranty work shall be performed by seller at its facility in Kansas City, Kansas and seller shall not be liable for any warranty work or other repair or replacement of defects in workmanship or material performed by any other party. It shall be the sole responsibility of buyer to pay for and ship all components claimed to be defective to seller’s facility in Kansas City, Kansas. No benefits or remedies are available under this limited warranty while the invoice for the unit or related services remains outstanding. Lower Units are special order and are non-returnable. Please see our Lower Unit Warranty section for details regarding our 1 year limited warranty. The purpose of a core deposit is to give you money back on your old unit should you decide to participate. Initially, the core deposit amount is included on all order totals whether you participate or not. Once you return all of the appropriate core parts, we evaluate those parts then refund the core deposit to you within 30 days of receipt of your old core. Please review the full procedures below. You can also download the core return form and print the form to send along with your core return. All of the parts must be present regardless of the condition to be eligible for the deposit return. We retain sole discretion to determine if a core is re-buildable.